Halloween is the ideal moment for transforming yourself into a fairy queen, a shower stall, an adorable bunny or an I’ll-never-sleep-again-zombie. Nothing stimulates the shock effect like fake blood, but for women and young children with sensitive skin, makeup can be extremely irritating to say the least. 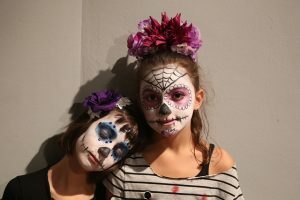 We always choose “treat,” and this Halloween is no different, so to avoid unwanted tricks, make sure you also choose organic makeup to embellish your Halloween look. What are organic cosmetics? What makes organic cosmetics preferable to traditional ones? Organic cosmetics differ from commercial ones because of the ingredients that compose them; very often personal care products like creams, makeup and hair products contain “bad” ingredients for our body. These are silicones, parabens and petrolatums that often risk damaging our skin and our health. While commercial products often boast results including smooth and silky skin, oftentimes, the harmful ingredients in those products are not able to sustain the natural physiological processes of our skin and end up occluding pores, which leads to the formation of impurities. Natural and organic products, however, offer the same effectiveness of the ingredients that make up the commercial products without damaging our body. There are also differences between natural and organic products, which again relate to the ingredients they contain. Natural cosmetics consist almost entirely of ingredients derived from plant extracts, as do organic cosmetics, which are made from vegetable raw materials. However, the difference lies in that organic cosmetics are derived from organic farming. These are therefore ingredients that are extracted from renewable sources using non-polluting methods. In organic cosmetics, attention to ecology is also evident in the packaging of these products, which are often made of biodegradable and recyclable materials. Choosing organic cosmetics products is one way of protecting sensitive skin. Have a look at the following five suggestions to protect your delicate skin during Halloween. Make sure your child avoids wearing makeup if she suffers from allergies to nickel or metal and atopic dermatitis. Alternatively, there is always the traditional mask. Choose cosmetic products with vegetable or food coloring to avoid nasty skin irritations. Test the makeup in a very small dose on your child’s arm and wait about ten minutes to see if there are any unpleasant reactions. Avoid applying makeup to the contours of the eyes and mouth where skin is particularly sensitive. Cleanse your child’s skin morning and night using micellar water that captures makeup and dirt residue. Micellar water is a skincare product that looks and feels just like regular water with an incredible ability to remove makeup, cleanse, and tone with just a few swipes of a cotton round. With micellar waters, even waterproof makeup melts cleanly off skin with zero irritation. They contain no alcohol, and are comprised of only dirt-loving micelle molecules that attach to makeup and debris to break it down. Use Organyc 100% pure, organic cotton rounds to remove makeup. Organyc’s cotton rounds are are soft, but strong, making them great for use with cosmetics or other body care products.